Designed for the home theater owner, the Python Digital HDMI Switch easily and efficiently integrates multiple HDMI and/or DVI-D compatible equipment. It finally ends the fumbling of cables during frequent plugging and unplugging between signal sources. 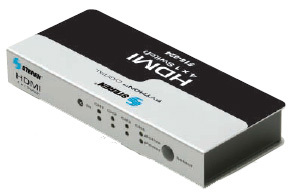 The HDMI switch enables selection of digital video and multi-channel digital audio from different sources, including digital video recorders, cable/satellite digital set-tops, and DVD players, for display on an HDTV or monitor. All that’s required for a quick installation are HDMI male-to-male cables. Or use adapters for DVI-D (video-only) digital connections. With the simple push of a button on the remote control, anyone can remotely select from different digital video and audio devices for display. The switch supports all HDTV resolution formats up to 1080p, or 1920x1200 pixel resolution for computer monitors. Inputs: Up to 6 ft. max. Output: Up to 15 ft. max. Net weight: 516-024: 11.6 oz.